It is extremely important for professional photographers to showcase their work in an exciting and exhilarating way and there is nothing better than an online website showcasing your photography. With a website, you break being a localite and go global. When it comes to choose the right platform or content management system for building your photography website or doing photo blogging, the only best choice to make is selecting WordPress as your content management system, due to its flexibility, ease of use and zero cost. So, If you are a photographer and looking for a WordPress Photography Theme, then you have come to the right place. Here, in this post, you will find some of the best and free photography themes for WordPress. Each WordPress Photography Theme listed in this post has been appreciated by hundreds and thousands of users because of their looks, build quality, features and functionality. 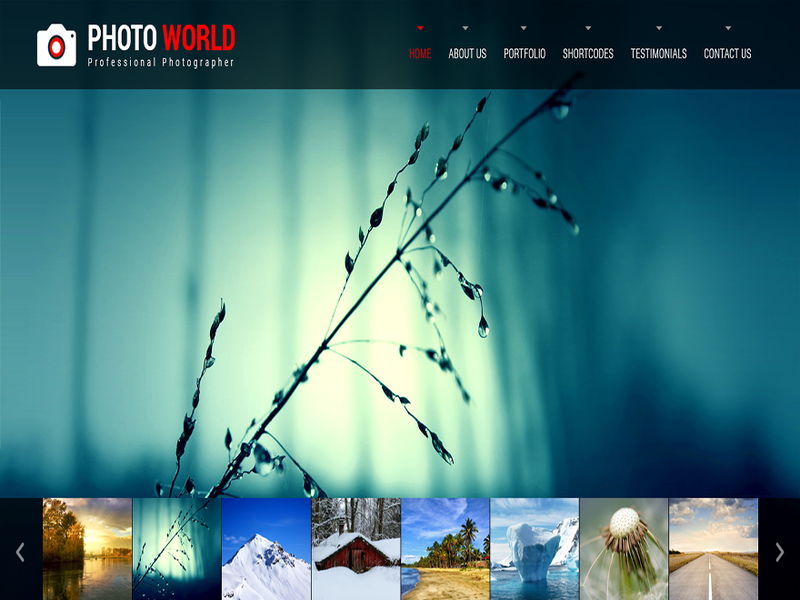 All WordPress Photography Themes listed in this post are absolutely free to download and use. All you need to do is browse through these themes and select the one which you think could be best for your photo blog. Later, you can follow the directions provided in the help documentation inside the download package or source website to install and configure these themes. If you still don’t find the one which you were looking for, then you may want to have a look at my earlier post on WordPress Portfolio Themes. If you think this post has helped you in any way, please share it with your friends and help it grow. 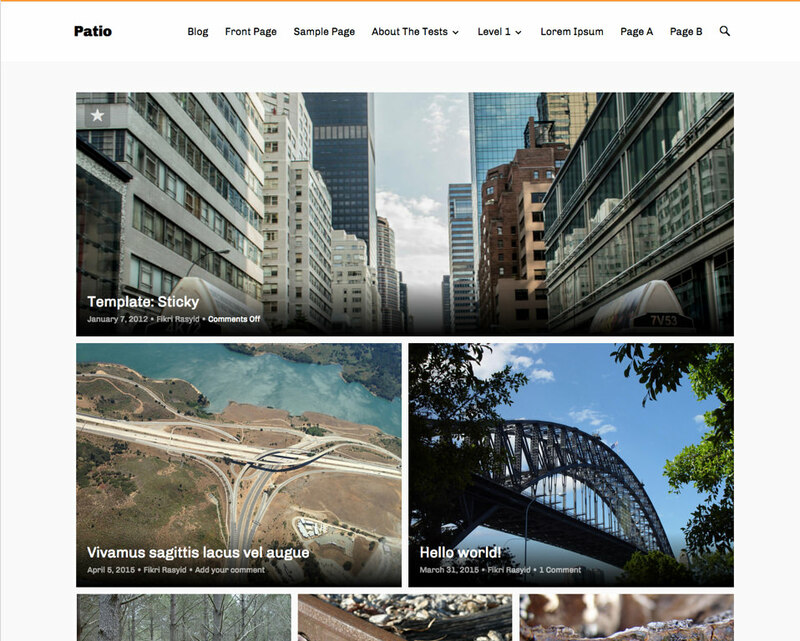 Patio is a beautiful WordPress Photography Theme to showcase your photos. It allows you to show featured images on homepage which gives your home page a very nice look and feel. Patio is a photo-centric theme and encourages you to use featured images in your post because it showcases these images on the homepage beautifully. One page scroll, as the name says, is a one page responsive WordPress Theme best suited for showcasing photography. It has been designed and built using the Twitter Bootstrap framework. It also has provision for retina ready Font Awesome icons integration. One Page Scroll allows you to set a custom logo, favicon, typography and lot’s more with the use of “Options Framework Plugin”. Each section within the home page can have its own parallax background image and colors, which is great. One Page Scroll makes use of WordPress gallery shortcode beautifully to display your photo albums. 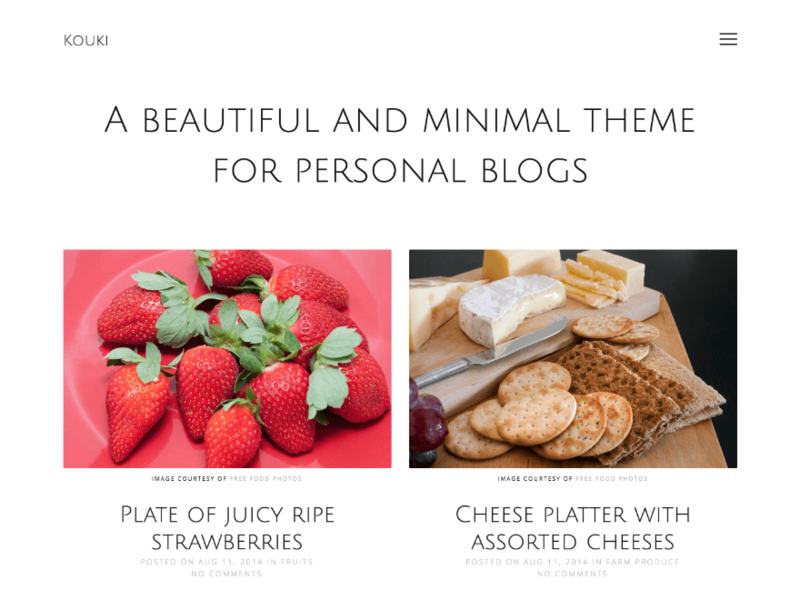 All in all, it’s a great WordPress Theme for Photographers to start photo blogging. 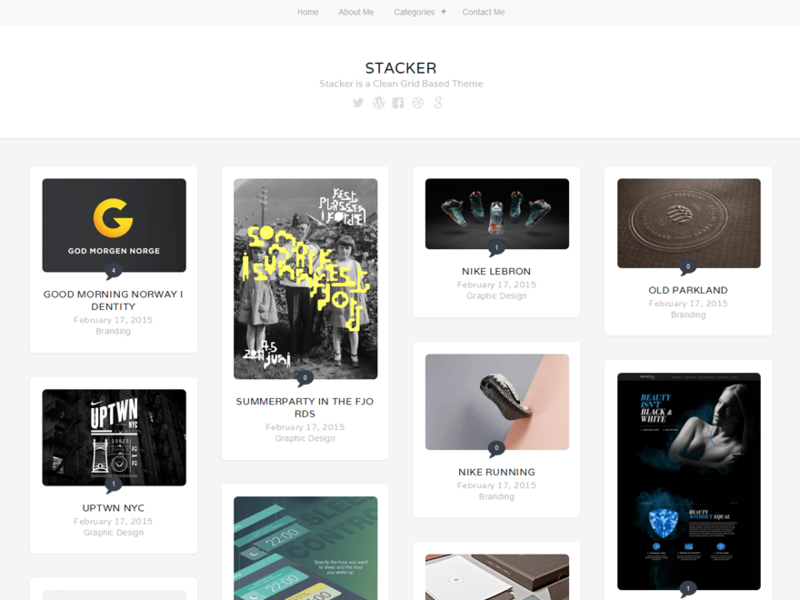 Stacker Lite is a beautiful grid based Photography WordPress Theme for photographers to showcase their photos. The home page shows off your posts in a grid very nicely along with perfectly aligned logo and social icons below it. Kouki is one of my favorite photography theme due to its minimalist and unobtrusive design. 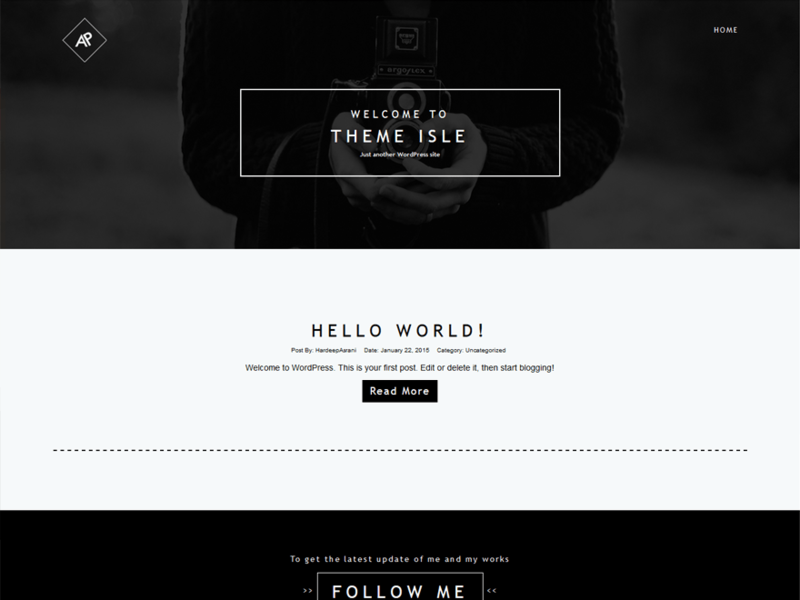 Kouki is a perfect fit WordPress Theme for a photography blog. Kouki is responsive Photography WordPress Theme and comes with plenty of features to choose from theme options. 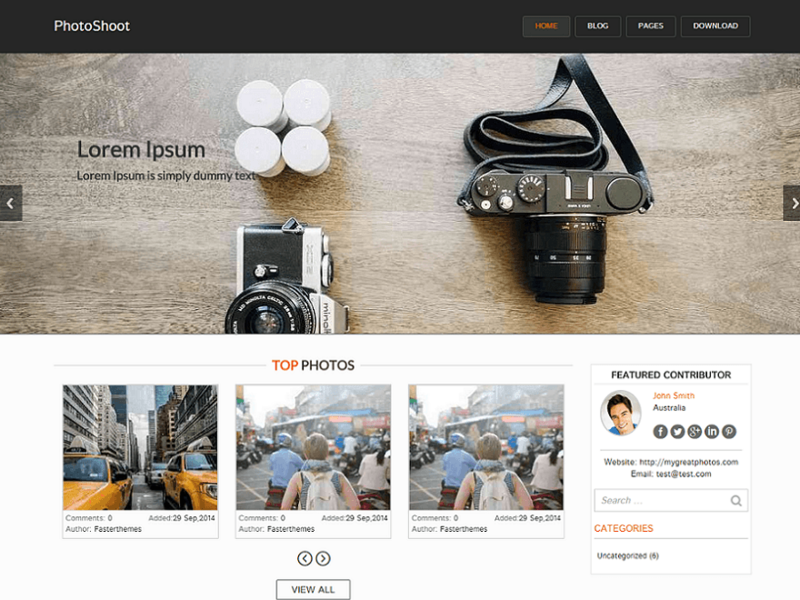 Photoshoot is a very clean, responsive and modern WordPress Photography Theme with responsive design, mainly designed for Photographers who want to showcase their portfolio of photo shoots. 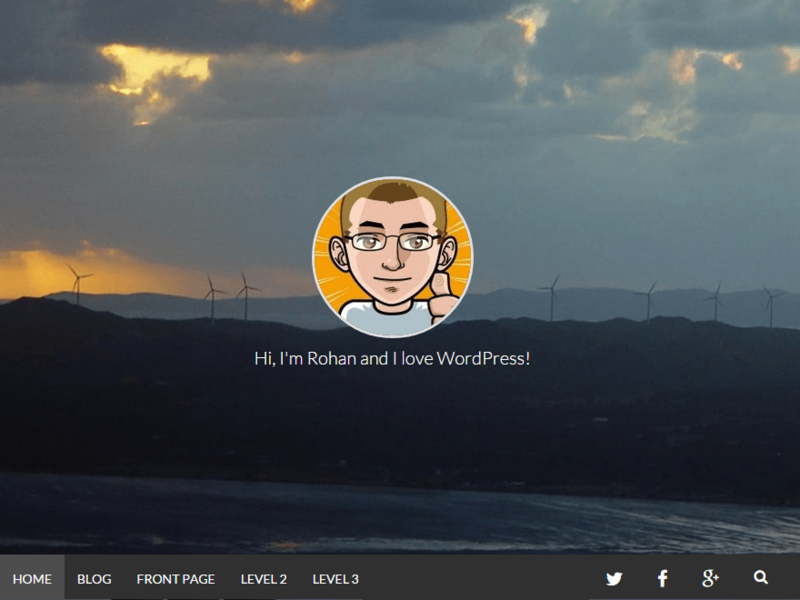 RokoPhoto Lite is a light and elegant WordPress Theme for Photographers to showcase their photos professionally over a blog. 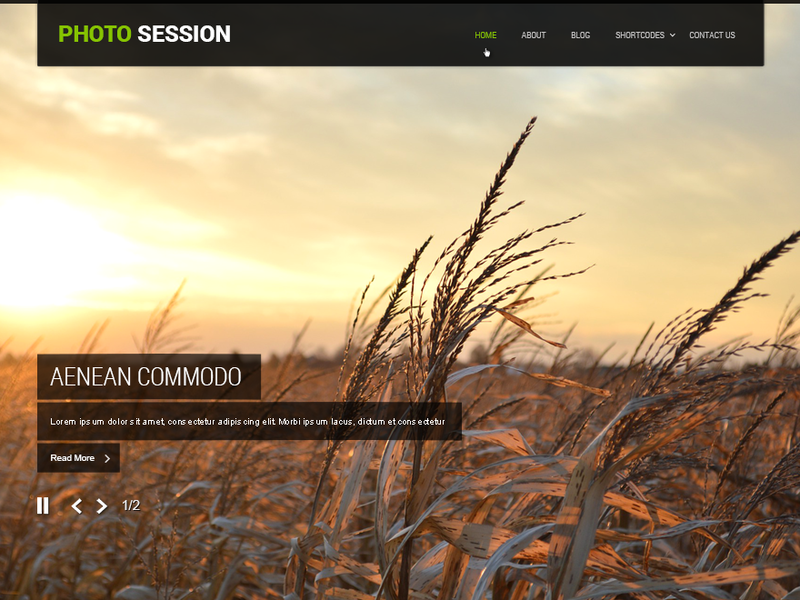 Photo Session is a very nicely thought and designed responsive photography theme for WordPress. The home page is entirely dedicated for showing images. It also has compatibility with popular WooCommerce and Contact Form 7 compatibility. A quite similar theme as Photo Session for photographers. The home page is again dedicated for showing off your beautiful images in the form of a gallery with a slider. It also has compatibility with popular WooCommerce and Contact Form 7 compatibility. 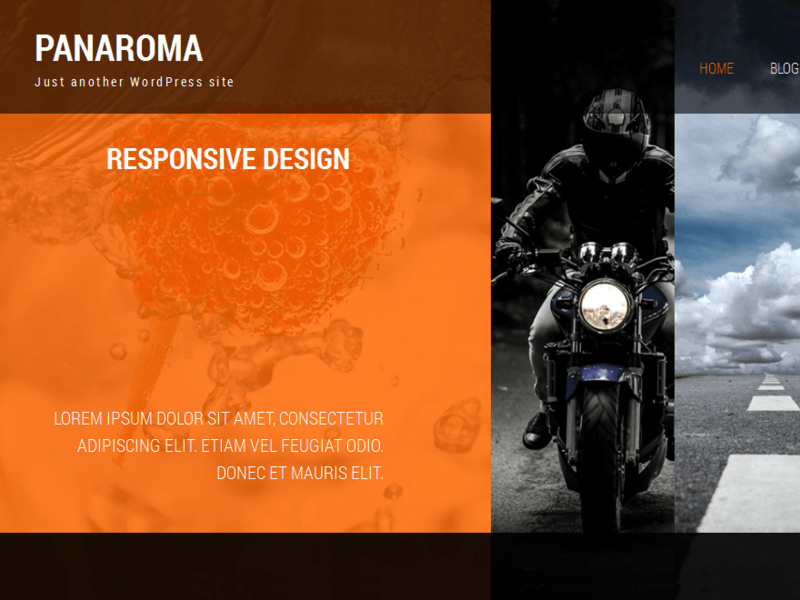 Photomaker is not only a color rich WordPress Theme but features rich too. There is no doubt that it is one of the best options available for photo blogging. PhotoMaker comes with a lot of customization features wherein you can customize the texts, background and logos etc. Adirondack has a very clean layout and showcases your posts images in the form of big tiles on the home page with grabs everybody’s attention. 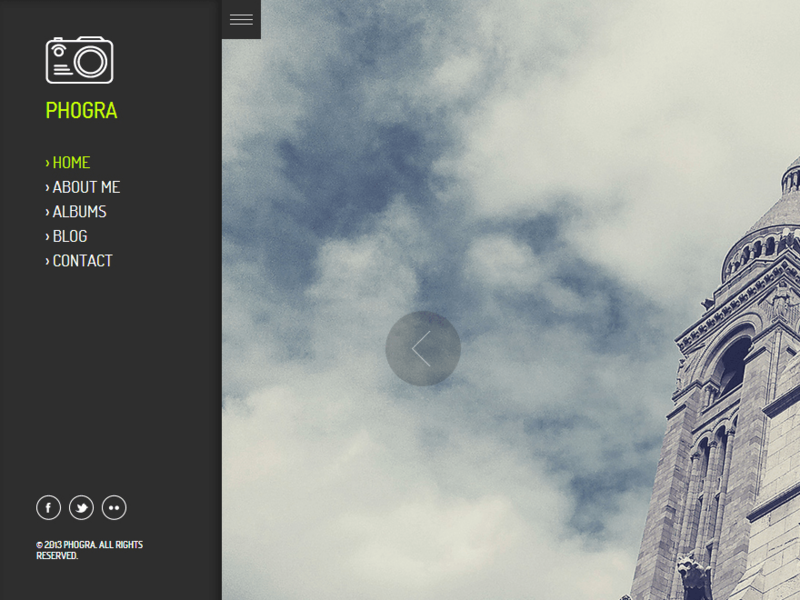 A very nice WordPress Photography Theme for photographers. 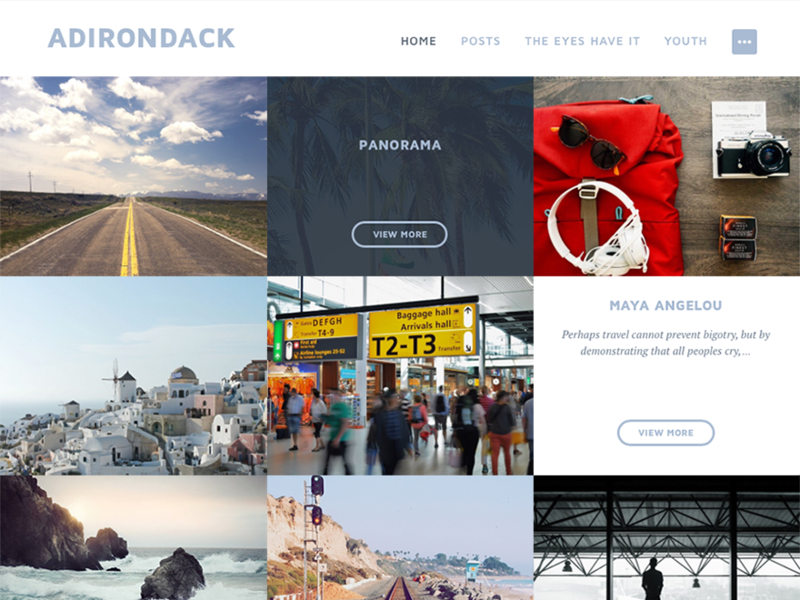 Panaroma is a multipurpose WordPress theme but from my point of view, it can be used as a professional Photography theme to build photo blogs. It’s home page has got some nice animated effects which makes this theme visually very appealing. 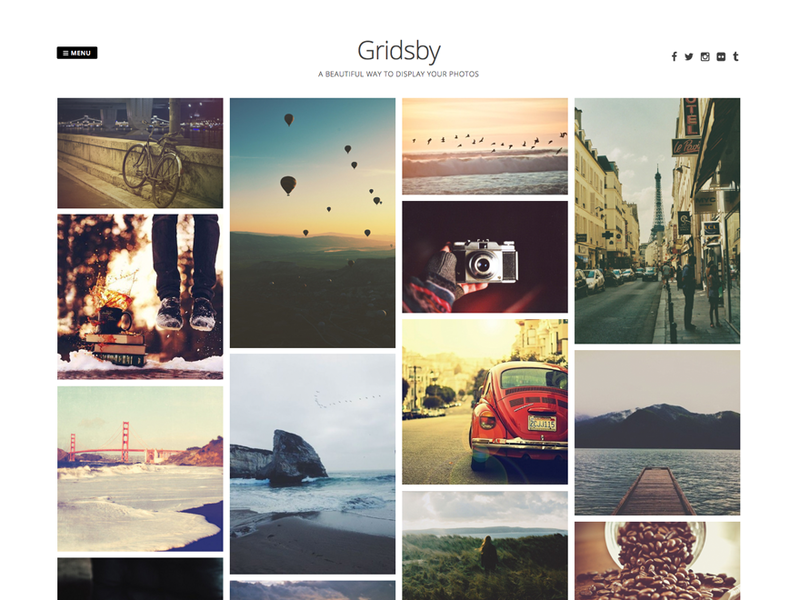 If you want to showcase your photos in Pinterest style grid, Gridsby would be the right choice for you. It has a very clean and responsive design and allows you to post your images directly onto the home page. GK Portfolio is another great WordPress Photography Theme for photographers with very strong visuals. GK Portfolio, with clean, elegant and creative design, it makes your creative work talking. 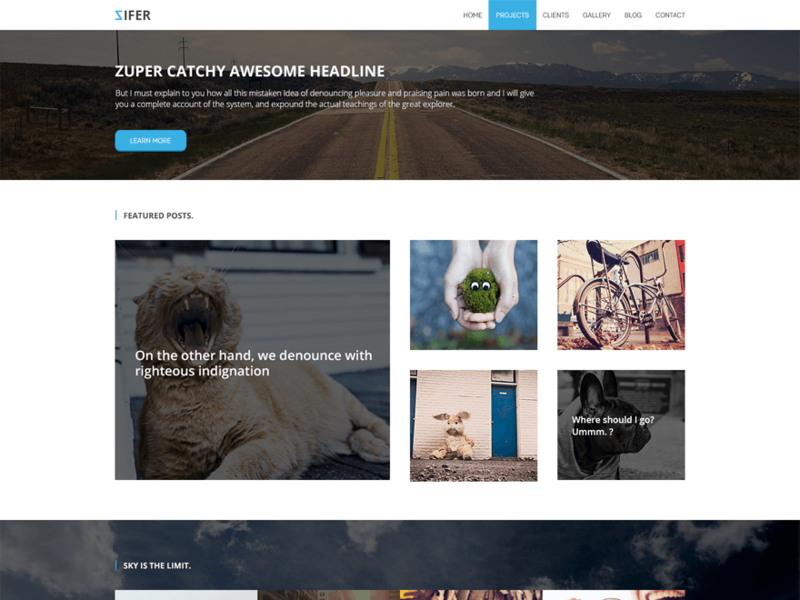 Zifer Child is another very well designed and optimized Photography WordPress Theme to create awesome photography portfolios. 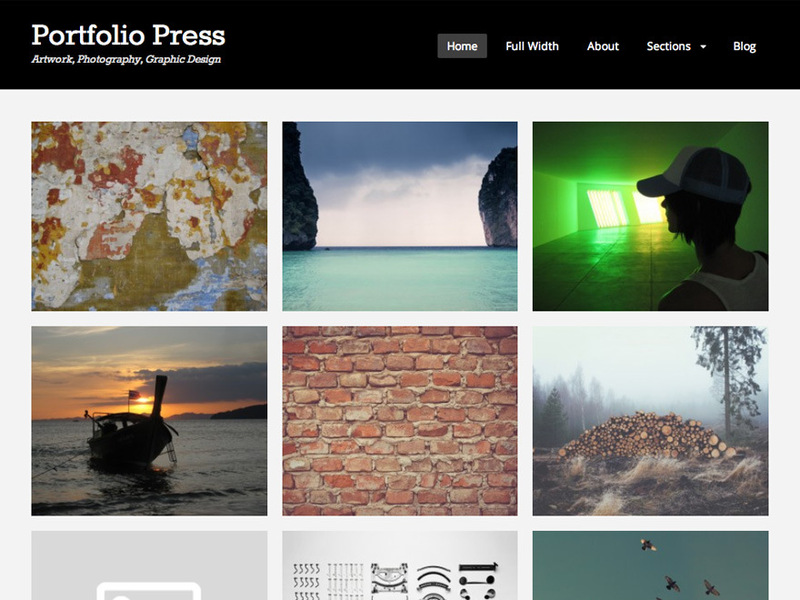 SoloFolio is a simple and minimal Photography WordPress Theme with a personalized touch. The design gives it a very personalized kind of look and feel. Though it looks simple but not simple in features and functionality. It allows you to create responsive photo galleries with retina images and the responsive design looks stunning on mobile and tablet devices. 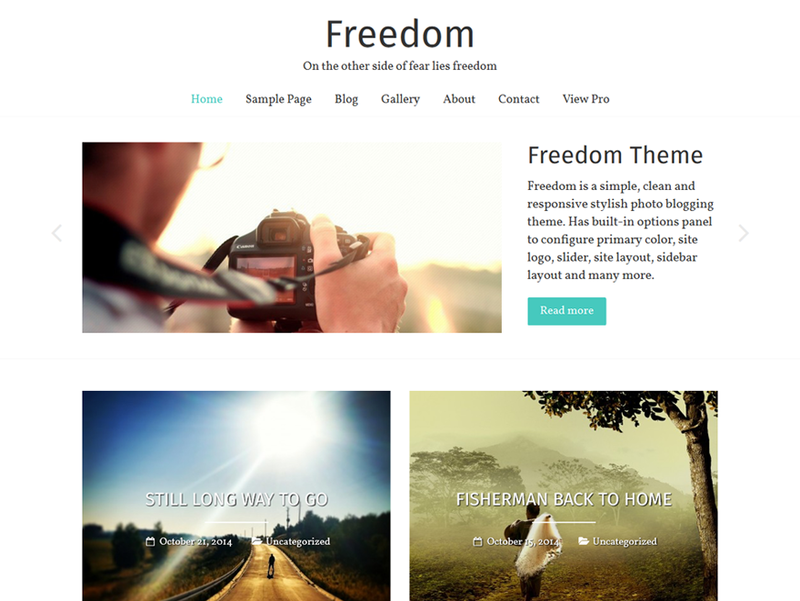 Freedom is a photo blogging WordPress theme designed specifically for photographers to blog about their work. Freedom has a responsive design which makes sure that the theme will look good not only on desktops or laptops but on smart devices like mobiles or tablets too. It comes with packed features using which you will be able to customize this photography theme as per your own taste and requirements. Plaino has a minimal but yet powerful design. It comes with a practical and very good looking grid style gallery along with a full width page template, normal sidebar templates and two widget areas. Though it’s been designed for photographers but can also be used for any other purpose too. 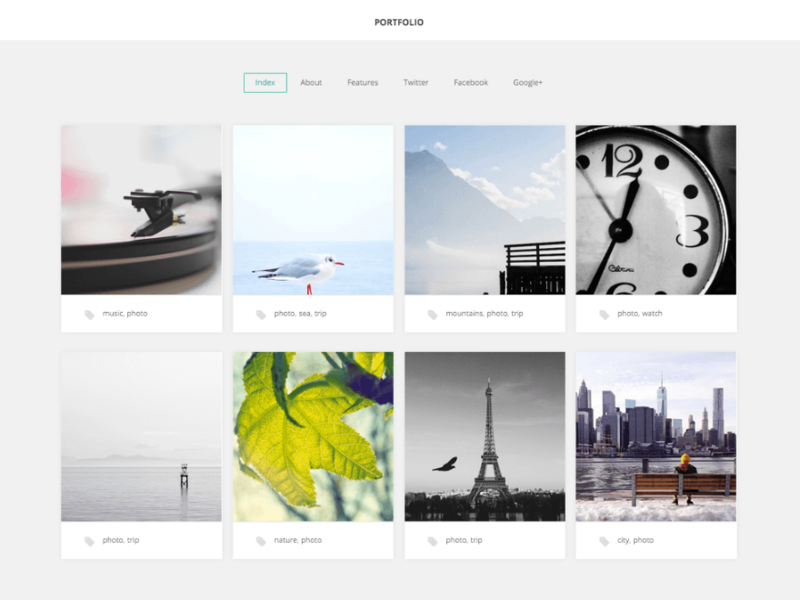 Electa is a beautiful grid based Photography WordPress Theme for photographers. 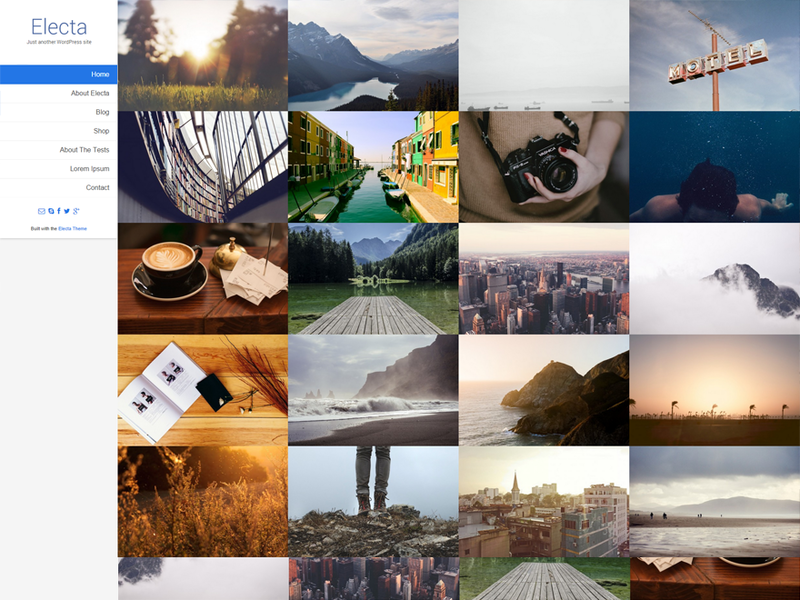 It shows all your featured images on the home page in the form of a well aligned grid. 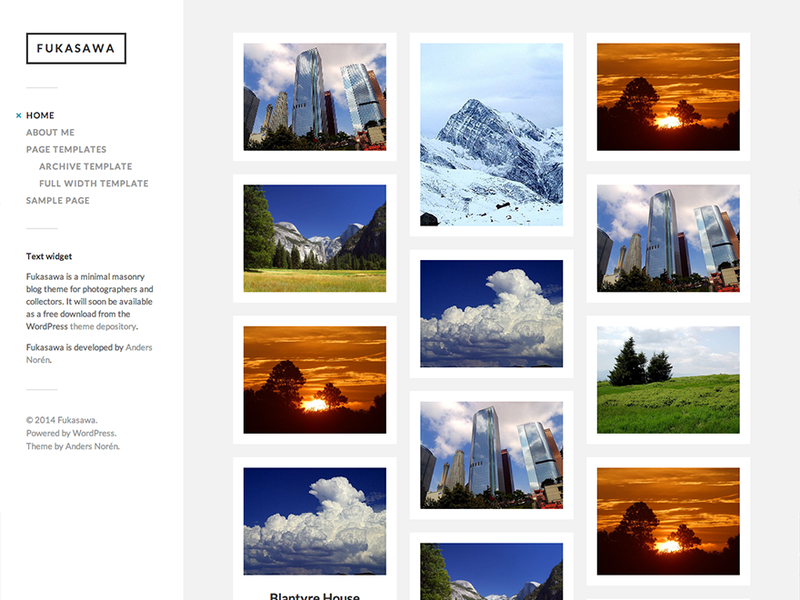 Fukasawa is a masonry style Photography WordPress theme designed for Photographers. 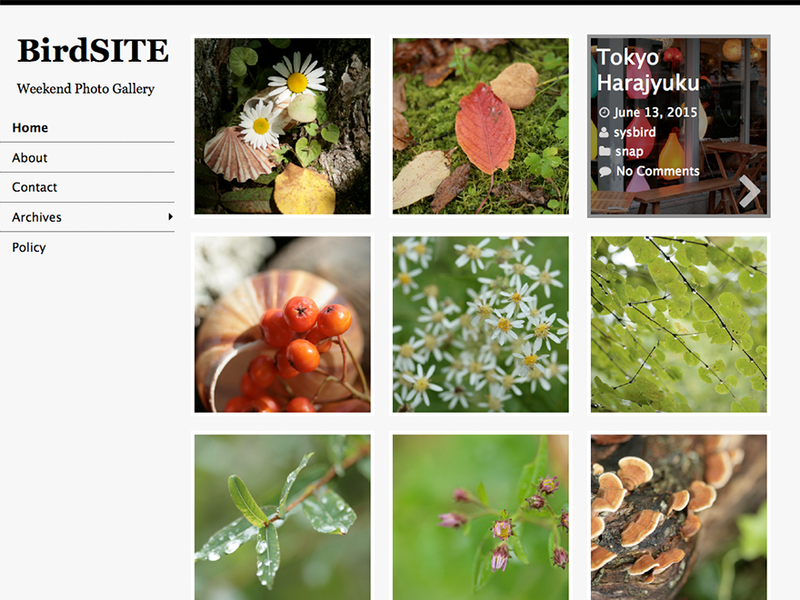 Fukasawa features a responsive and retina ready design with images and galleries post formats. Fukasawa is translation ready and comes with a gallery slide show, custom accent color support, five custom widgets, custom logo support and an archive page template. 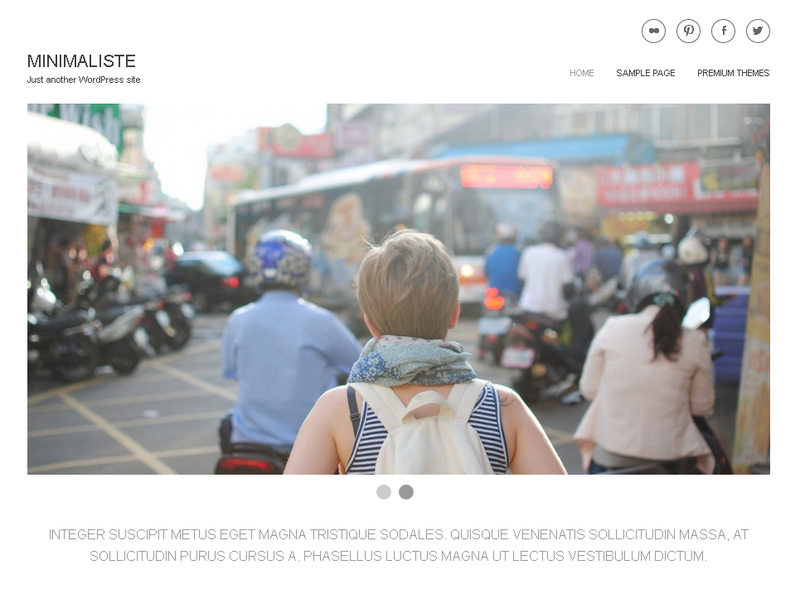 Minimaliste is a very clean and minimal WordPress Photography Theme which can be used for your photography website. 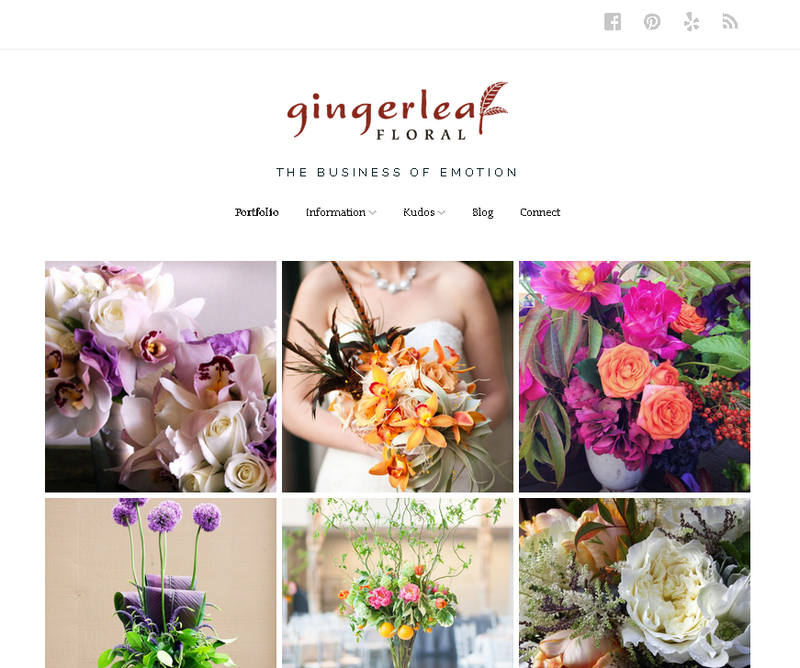 You can show a large image slider on the home page and post pages, showcasing your featured images beautifully. 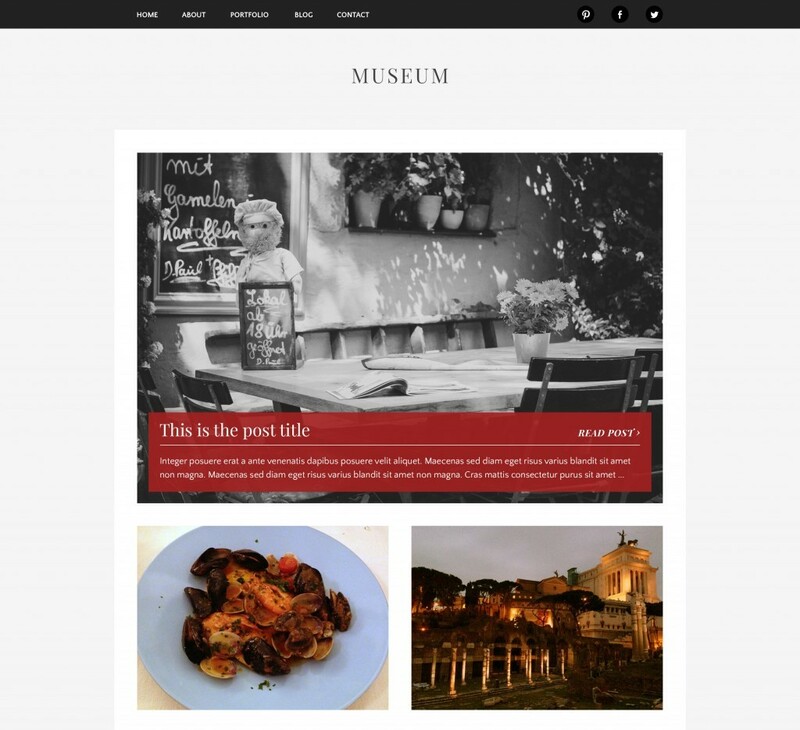 Museum is a typography inspired WordPress Photography Theme with a very simple intention of showcasing your photos or collections in an attention grabbing way. 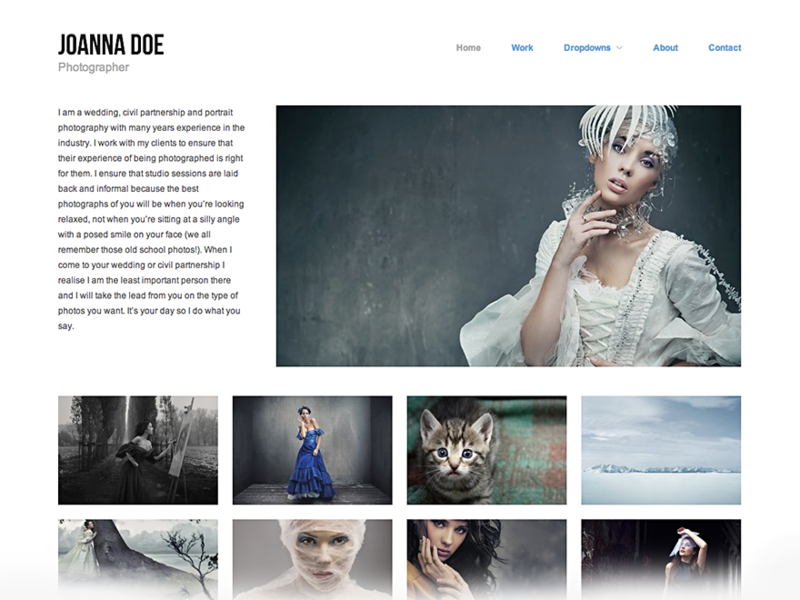 Phogra is truly a Photography WordPress Theme for Photographers with a responsive design and customizable photography portfolio. 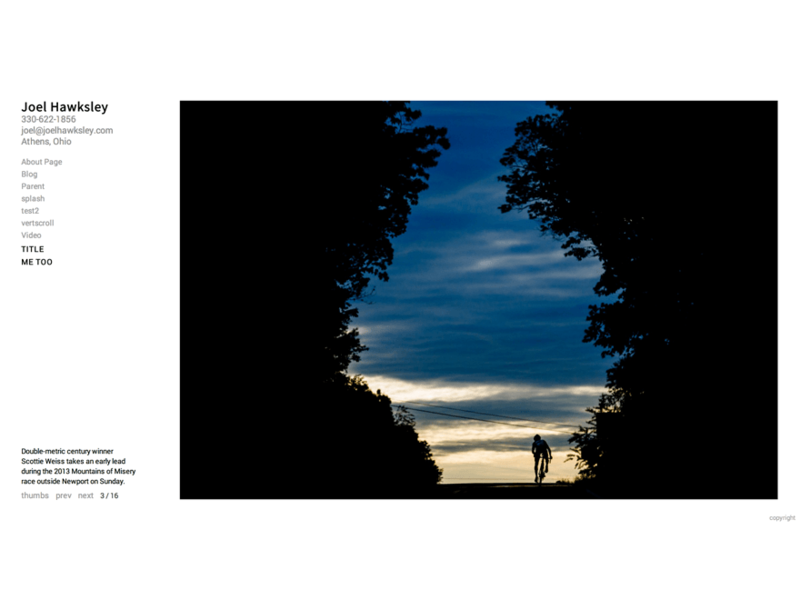 It allows you to showcase your photos on a very large area as you can see on the image below. 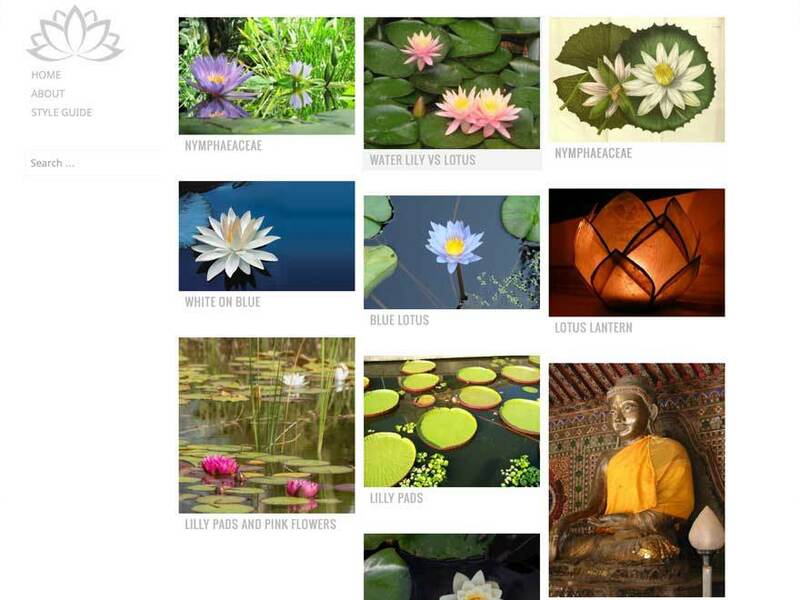 Water Lily is a very minimal and responsive theme designed to showcase photography in masonry style. 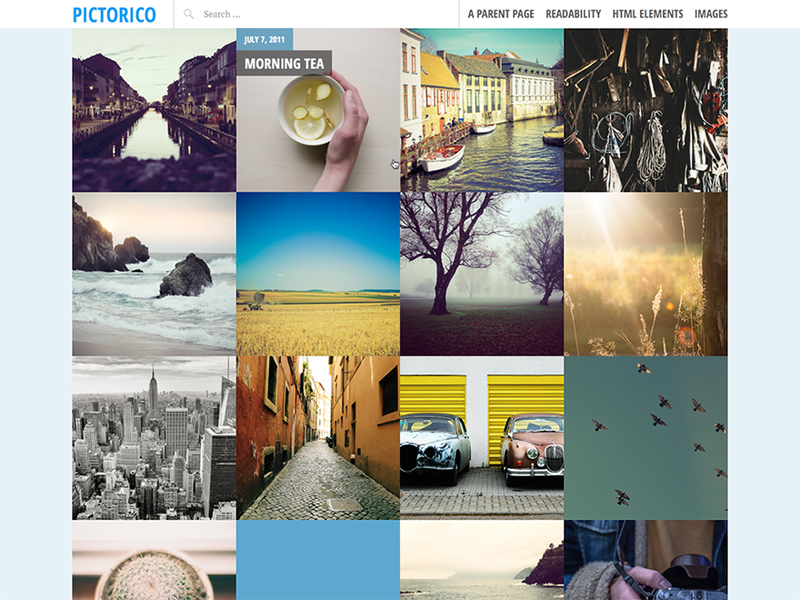 Pictorico is another grid based Photography WordPress Theme with large featured images on the home page. 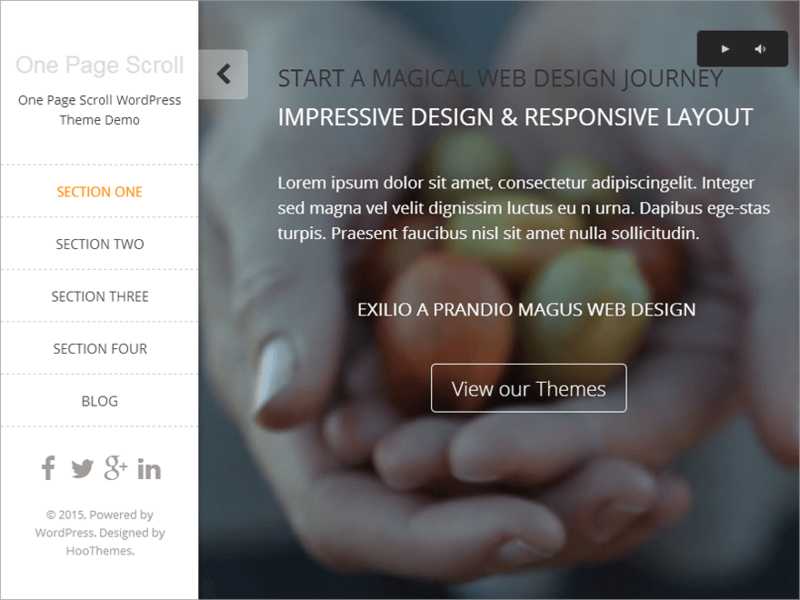 The fonts used in this theme are really beautiful and enhances the overall look and feel of the theme. Pictorico is perfectly suited for photographers to build their online presence. 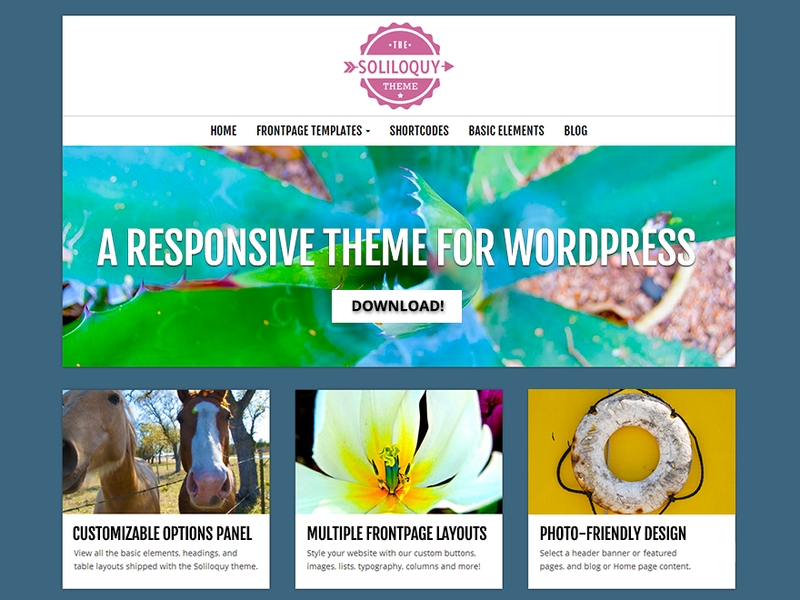 Soliloquy is a very clean, modern and responsive WordPress theme built using Bootstrap framework which makes it super responsive for tablet and mobile devices. Though this theme was not specifically designed for photographers but there is no doubt it can be used for photography due to its versatile design. It comes with both right and left sidebar options to choose from and a lots of post options. 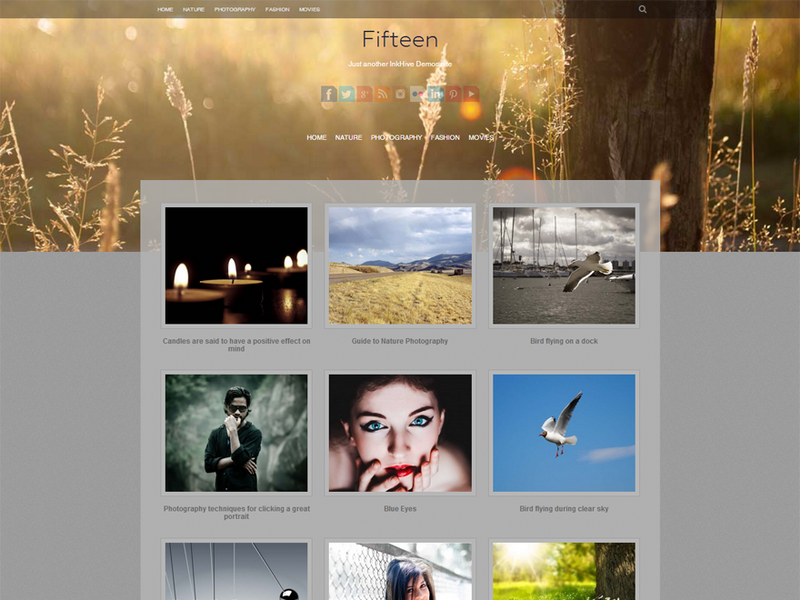 Fifteen is a brilliant responsive WordPress theme designed for artists, which means, it can be used as a photo blog too. It is built using HTML5, CSS3 and Bootstrap 3.0 Twitter framework. It has three column grid layout for home page, supports featured images within the posts, custom widgets and multiple page type options. The best part about this theme is that it is translation ready and includes language files for Spanish, German and French by default. 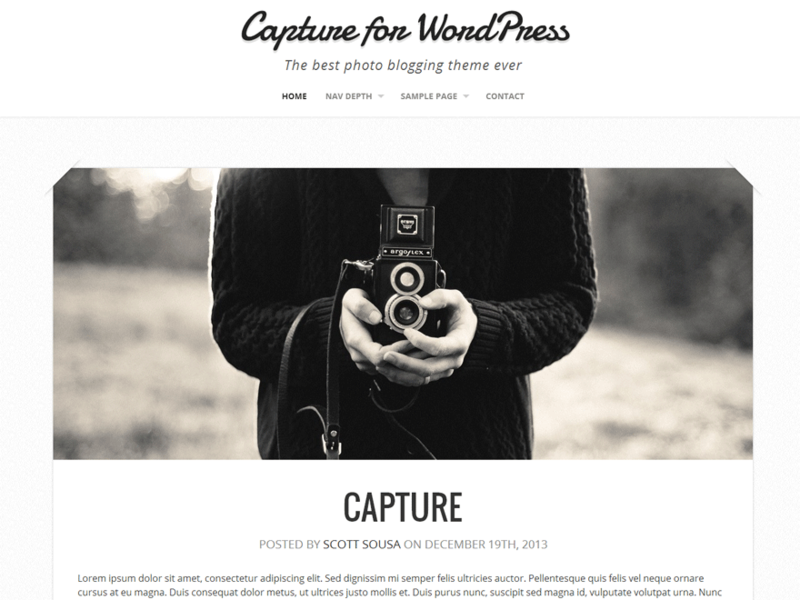 Capture is one of my favorite Photography WordPress Theme due to its simple, lightweight and responsive design. Capture has been specifically designed for photographers to showcase their work or portfolio’s. It comes with a full screen featured image slideshow and video support. Another added advantage of Capture is, it comes with full WooCommerce support, which allows photographers to sell their photos online, if they wish to. 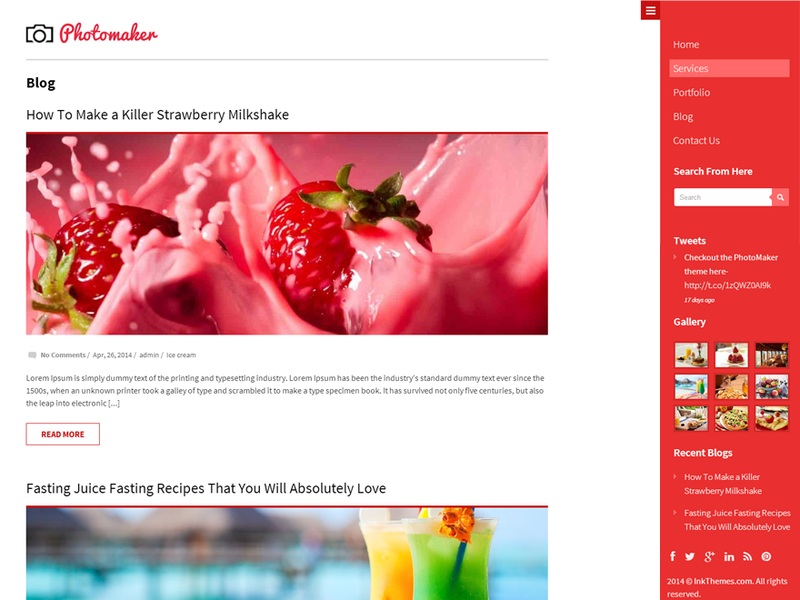 Make is on the top of my favorite WordPress Photography Themes list because of its design capabilities, flexibilities and responsiveness. You can virtually create any website with it without even touching a line of code. It has been designed with powerful customization features and drag and drop page builder which makes it extremely easy to use this theme. The screenshot shown below is one of the live sites created using “Make” theme. Make allows you to customize almost everything like colors, layouts, fonts, background and logo. Being a free WordPress Photography Theme, “Make” is power packed with support features and fully compatible with some of the most popular plugins like Gravity Forms, Contact Form 7, WooCommerce, Jetpack, and WP PageNavi. 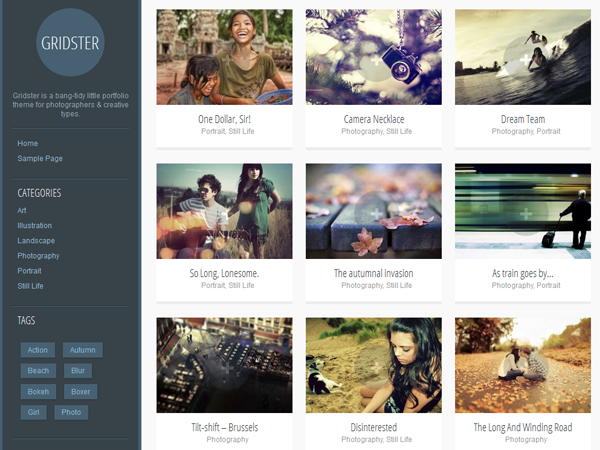 Gridster-Lite is a nice grid based responsive WordPress Photography Theme for photographers and creative artists to showcase their work. The home page, as you can see in the screenshot below, has a left side bar and on the right, you have space to showcase your work. A pretty well thought and designed theme for professionals. 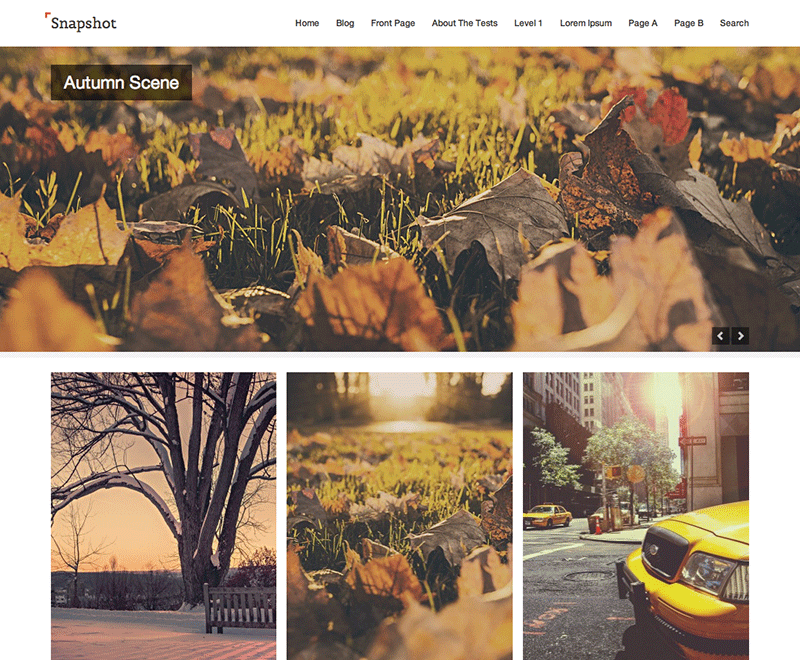 Snapshot is specifically designed WordPress Photography Theme for photographers to showcase their photography. It has the powerful drag and drop page builder which makes it extremely easy to add content in it. Hatch is a minimal WordPress Photography Theme for photographers and photo bloggers. It has a beautiful responsive design which makes it look good not only on desktops or laptops but on smart phones and tablets too. It is a best suited photography theme for photographers with some good customization options too. Portfolio Press is yet another very nice, clean and responsive Photography WordPress Theme for Photographers. BirdSITE is a pure photo blogging theme for photographers with a nice and clean grid layout along with several customization options. I was planning to start my portfolio and looking for a free WordPress theme and now I am sure that Gridster is the one I need.